Sonoma residents survey the damage in Santa Rosa. In the middle of the night, the wind howled. Smoke filled the air. By dawn, the gales had slowed; the air had cooled. For a moment, the clouds of smoke could be mistaken for fog. Until you breathed. There's no escape from the eerie scent of smoke. You shower but still reek of it. You look to the sky, a surreal, hazy burnt-orange glow. You look at the ground, dusted with ash. The signs of the fire are everywhere. Everyone has the same look of shock and disbelief. It happened that fast. Entire neighborhoods have vanished, replaced by charred rubble, blackened tree trunks and lone-standing chimneys—a surreal scene out of a post-apocalyptic horror film. At every gas station, lines of cars wait their turns at the pumps. Bottled water, transistor radios and pollution masks are at a premium. Grocery stores look as if they've been looted, shelves empty. Despite the devastation and confusion, however, communities are rallying. Their fighting spirit is back. But the reality of the 2017 Harvest Inferno is slowly sinking in. Most of this year's grape crop had already been harvested by the time the fire began Sunday night, but not all of it. There's still some prized Cabernet Sauvignon hanging in Napa and beyond. That matters less today as people scramble to reconstruct their lives. It will matter more in the coming weeks and months, as wine is the lifeline in these parts, the economic engine that drives Napa, Sonoma, Lake and Mendocino Counties. Smoke taint may be the final blow struck by the inferno. For yet-to-be-harvested Cabernet vineyards, hope isn't lost yet. But the threat is lurking, and the longer the grapes hang on the vine, and the longer the smoke hangs in the air, the greater the threat. For now, the fire is on center stage, filling the skies with smoke that chokes the lungs and burns the eyes. But the blaze won't escape California's bravest, who are saving lives and battling it on every front. This continues to be extremely sad. 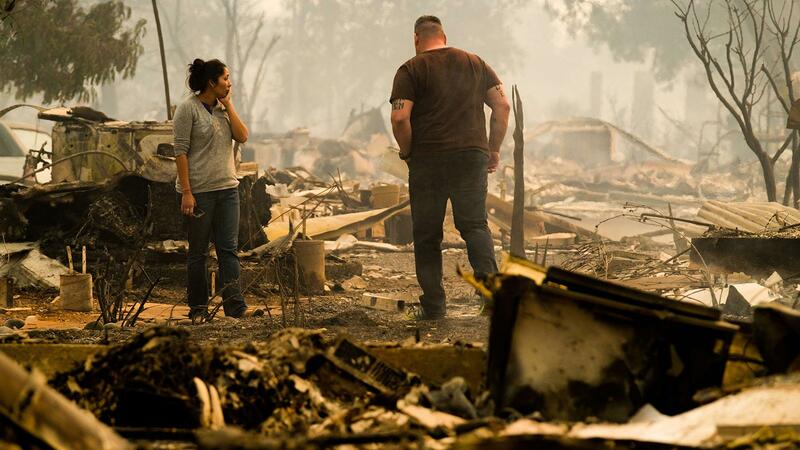 I want to focus on those impacted the most (families in Santa Rosa), but it is hard to ignore the pictures and damage in Napa as many of those wineries and properties are household names (in wine circles at least). Having property in Napa and spending a good deal of recreational time up in Napa, I want to spend even more time up there to help the economy and people to get back on their feet. Trips to Santa Rosa are in my future as well. My family properties were spared for the most part (garage and vineyards burned down), but being up there last week on the 11th, I can see the desperation in peoples' eyes. I can also see and hear their determination to get back in and to help rebuild. I hope to help this Phoenix rise and rise larger than before...Love and prayers to all that have been affected by this natural disaster. I wrote this comment and attached it to your June 27, 2006 blog "Two Hot Labels to Look For" hoping for a response but I assume you don't monitor your old blogs to answer questions readers may have, so the following is my original question hoping you read it and respond. What happened to Rhys? I read this article posted on their website but I thought I remembered a more recent reference in WS that prompted me to check out their website and join the wait list. I recently received notice that I would receive an allocation of their wine and would like to buy some. In the past I've used WS wine ratings to help with deciding what and how much to buy, Kosta Browne and Dancing Hares are two examples. Unfortunately, the last time you rated Rhys was 2013 and only one vineyard, Bearwallow. What happened? Absent any recent ratings do you still feel this is a good investment and if so which vineyards show the most promise. Thanks!